Upcountry politicians in the ruling alliance pledged support for worker demonstrations in the central highlands that entered their eighth day yesterday, calling for just wages for Sri Lanka’s estate labour force. Addressing a press briefing yesterday, Ministers Mano Ganesan, Palani Thigambaram and V. Radhakrishnan said the Tamil Progressive Alliance (TPA), which the trio is leading, had organised a mass demonstration in Thalawakele on Thursday (6), to agitate for a Rs. 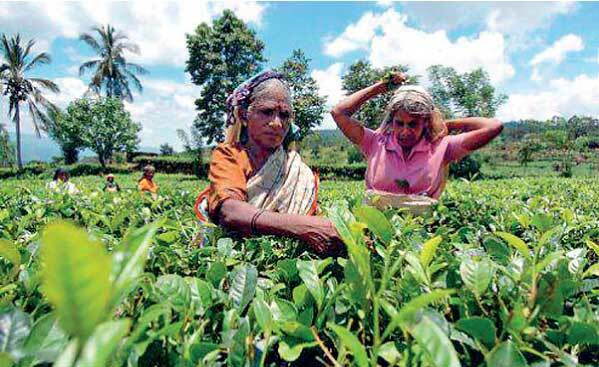 1,000 daily wage for plantation sector workers. “We ask everyone to support this demonstration in Thalawakele, irrespective of political party or trade union differences. It will be a symbol of our support for the estate workforce that is demanding fair wages,” Ganesan told reporters. Also addressing the press briefing, Minister Thigambaram said the TPA was calling on Plantation Industries Minister Navin Dissanayake to hold discussions on the issue of worker wages and resolve the problems as soon as possible. Thigambaram noted that the ongoing demonstrations in the hill country were non-partisan, with most upcountry parties supporting the worker demands. For eight days tea plantation workers in the hill country districts have launched spontaneous demonstrations demanding a wage hike up to Rs. 1,000 a day, based on promises granted to them ahead of the 2015 elections. Workers strike during the morning hours, converging on townships and blocking major roads as they protest. Provincial correspondents in the region say the protests have intensified over the past week. The plantation towns of Ragala, Maskeliya, Samimalai, Watawala, Thalawakele, Agarapathana and Lindula in the Nuwara Eliya, Badulla and Hatton Districts have been staging grounds for the worker demonstrations. Many of the protestors have vowed to commence hunger strikes if their demands are not met, the correspondents said. A meeting has been scheduled tomorrow between plantation sector trade unions, estate owners and Plantation Industries Minister Navin Dissanayake, to discuss the way forward on the Collective Agreement that would adjust worker wages. Ministers Ganesan, Thigambaram and Radhakrishnan said there had been a 20-month delay in signing a new collective agreement between owners and trade unions that were delaying the wage adjustment for workers. “The workers are demanding a Rs. 1,000 daily wage and we support that demand. Let the estate owners now come back to the table with their proposals,” Ganesan said. Thigambaram told reporters that the upcountry politicians were unwilling to betray the workforce, by whose votes they had been elected to office. “We need the workers. We are in these positions because of them. We can’t betray their cause just because we are ministers now. So we stand with them in these protests,” Thigambaram said.